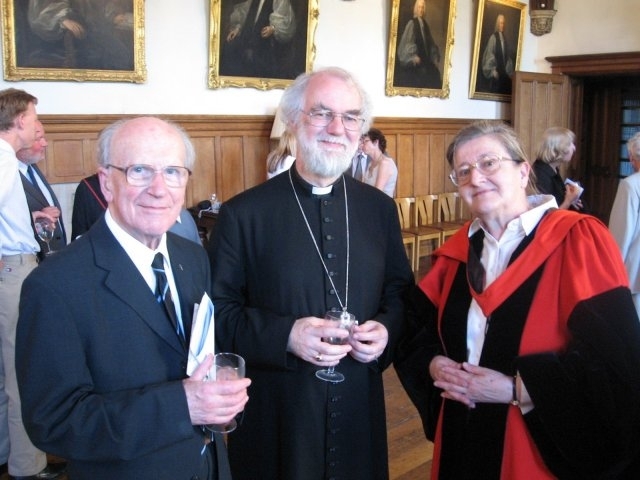 Margaret Barker, scholar and author of several books on the Jerusalem Temple and the Old Testament, has been awarded the degree of a Doctor of Divinity by the Archbishop of Canterbury. The ceremony took place at Lambeth Palace yesterday afternoon. Margaret received the doctorate "in recognition of her work on the Jerusalem Temple and the origins of Christian liturgy which has made a significant new contribution to our understanding of the New Testament and opened up important fields for research." The Archbishop of Canterbury's right to grant degrees is derived from Peter's Pence Act of 1533 which empowered the Archbishop to grant dispensations previously granted by the Pope. The practice began during the time when attendance at Oxford and Cambridge, the only universities at that time in England, was frequently disrupted by the difficulty of travel or outbreaks of the plague. The Archbishop was empowered to grant exemption from the residential requirements necessary for a degree. Margaret Barkers latest book, Temple Themes in Christian Worship was published in January.